Adobe Analytics says smart speaker ownership increased from 28% to 32% and expects penetration to rise to 50% by the end of the year. 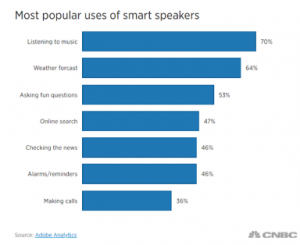 TiVo says that 38% of smart speaker owners used their device to stream and watch video on their TV in Q4 2017. To replace the operator set-top box: Comcast has just released a beta version of its Xfinity TV streaming app for Samsung smart TVs. To customize broadcast channels: BBC Research and Development is working on a way to personalize a broadcast channel with video segments delivered over the internet. 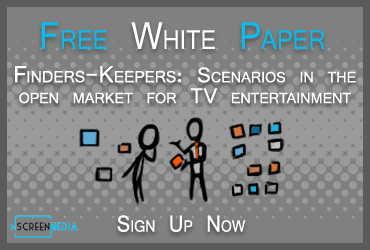 The functionality is being tested on on HbbTV 2 capable smart TVs. To be more respectful of owner privacy: Vizio will deliver a message on their smart TVs to advise viewers they may be part of a class action settlement. The class action is against Vizio for taking customer usage data without permission. 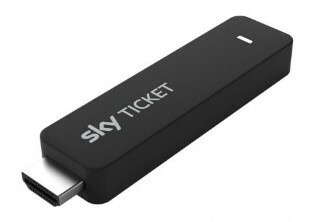 Sky Deutschland has just released the Sky TicketTV Stick, a Roku-powered device that plugs into the HDMI port of any TV. The advantage of the TicketTV Stick for Sky is that it can control the experience and prevent competitive services from appearing in the interface. The advantage for consumers is that when using it they can cancel at the end of the month rather than being bound in to a long pay TV contract.